The startup Sky Tronic, by designing and producing novel steering and flight control systems for Unmanned Aerial Vehicles or drones, has improved the precise use of these drones on special missions in difficult terrain and weather conditions. Sofia, November 15th, 2018. 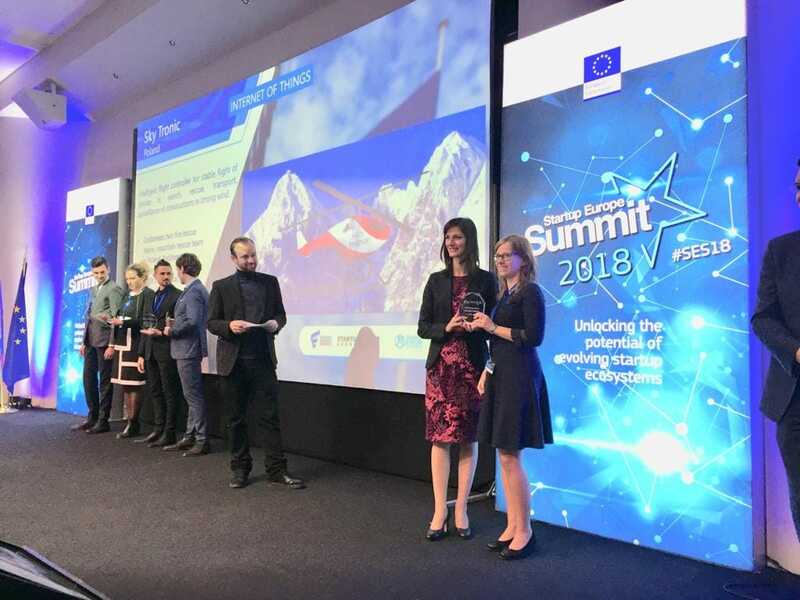 The Polish startup Sky Tronic has been recognised as the best European startup in the IoT category at StartUp Europe Awards (SEUA), an initiative of the European Commission and the Finnova Foundation in collaboration with Startup Europe. Justyna Gudaszewska, SkyTronic cofounder, was recognized as well as Best Female Entrepreneur for StartUp Europe Awards. After going through several stages and being chosen to represent Poland in this category, Commissioner for Society and Digital Economy Mariya Gabriel handled to Sky Tronic the diploma that accredits them as European winner during the Startup Europe Summit 2018 hold in Sofia, in the presence of Prime Minister of Bulgaria, Boyko Borissov and several European prime ministers and ministers. In her speech, Commissioner Gabriel congratulated Sky Tronic and the rest of the European winners and encouraged them to continue working hardly as they have been doing until now. “Europe wants to have more like you. More of your passion, dedication, talent and energy. We believe in your dream and you have already showcased that progress is made with small steps, and that to become successful it takes a long nights and serious thinking on how to approach the most challenging topics. You showcased that success can come from anywhere in Europe. And you showcased that in order to succeed you must be bold and brave”, she expressed. “StartUp Europe Awards proposes an open innovation methodology through public-private partnerships, “which works to help public entities to find a solution to their local challenges, and also to help startups by testing their innovations on pilots supported with European Union funding” said Juan Manuel Revuelta, director of the StartUp Europe Accelerator at the Finnova Foundation.